KIEV, Ukraine -- Ukrainians have celebrated the introduction of visa-free travel to the European Union with special events. 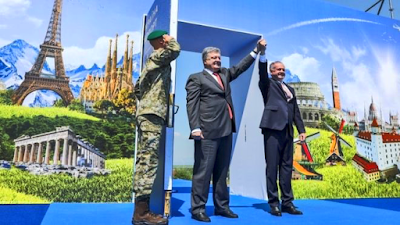 President Poroshenko opened a symbolic visa-free door to Europe and met Slovak President Andrej Kiska. President Petro Poroshenko hailed the "fall of the paper curtain" at a gathering in the capital Kiev. He also opened a symbolic visa-free door to Europe, and met Slovak President Andrej Kiska, at the Uzhgorod border checkpoint. However, Ukrainians who want to work in the EU still need to obtain a working visa. Travellers departing from Kiev's international airport were treated to music and dance. But in Russia, whose relations with Ukraine are tense, TV news downplayed the significance of the concession - and pushed the idea that the change would result in an influx of illegal labour migrants from Ukraine, and that the EU might eventually suspend the deal. The visa-free scheme allows Ukrainians with a biometric passport to enter the Schengen area - including some non-EU areas such as Switzerland and Iceland, but not the UK or Ireland - without a visa for up to 90 days. During their meeting at the border, President Poroshenko thanked President Kiska for his support on the road to visa-free travel in Europe. He said that Ukrainians were returning to the European family. "This is a historic moment when we are destroying the paper curtain that divided Ukraine from Europe," he said. "This means that Ukraine has implemented huge reforms. We changed the country together by our joint efforts - and our partners in Europe kept their word. " And the doors of the European Union, the doors of our friends and partners, are open to our great 45-million-strong nation, to the Ukrainian people."